Please look! This colored pattern of several kinds. 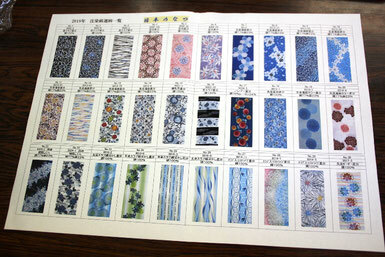 ※ 1 which is 30 points (2018 version) selected carefully from approximately 300 points of original designs of the yukata cloth that Shirai Corporation planned these every year. A sense to let it is novel and reappear to the present sense of the times is wonderful while taking good care of traditional good old textile. 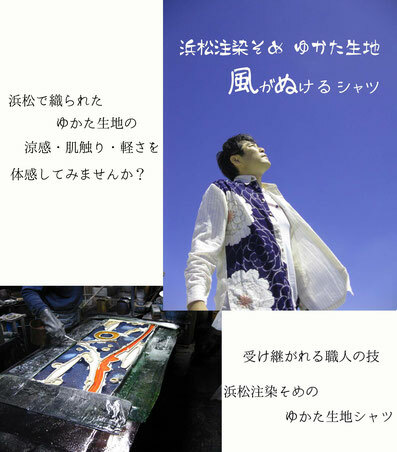 The Shiroi business affairs that I planned material and a pattern of the yukata cloth since the establishment of a business of 1985 originally and I crossed a tag with the weaver who was good to it, a dyer and produced it, and continued selling wholesale. Above all, I am impressed deeply with the technique that local Enshu can be proud of, and it "is 注染 (ちゅうせん) yukata" to lay emphasis for tradition. The traditional dyeing technique that lets a craftsman is manual labor carefully, and the dye which I put in a kettle for exclusive use of one of a thin beak from the cloth which I put on "注染" soak. 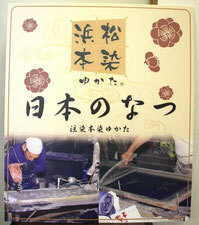 It is the skill to be able to tell even Hamamatsu to be treasure of Enshu inherited more than 100 years. The popularity that the color taste that I match it with the climate of the day by experience of a craftsman, and is mixed, a texture of shading off fine-tuned by a delicate allowance, a feeling of feel that nature-like is dried, and was finished soft of Enshu are deep-rooted. 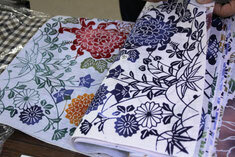 Mother, a daughter, the good-quality yukata inherited to a grandchild more are valuable gems from a grandmother. "I will send charm to the area in oneself to have you come to like a yukata and a kimono born in Enshu more including such 注染"! 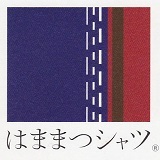 It is Seiji Shirai of the managing director I stand with a friend, and to have achieved と "いとまち project" (2015 start). Even if "注染 is splendid how, it is hard to convey it only by words". Then really watch a technique of a craftsman in front; "naturally as for being hard to image the atmosphere that wore even if the てもらおう which does not fit a yukata and a kimono watches a design in cloth." Then I will have you really wear it. 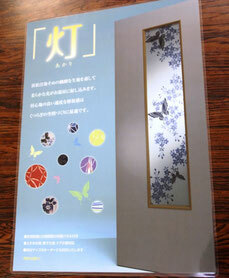 I came to show a technique and a work of a craftsman of Enshu to consumers for such an idea directly. Was Managing Director Shirai "who was totally unconcerned about own fashion", but transferred a woman handle of in men by an event; after wearing a design newly; is center of public attention in a moment. When "everybody tries the colored pattern that I have not worn so far because I prepare material and a design abundantly ," I smile. 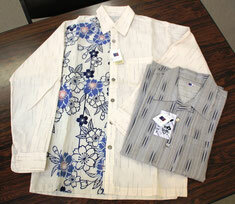 In addition, for a person thinking that a kimono and a yukata are a far-off person still more, Managing Director Shirai develops the shirt of the original brand. A colored pattern and the material of the design in Japanese dress "can dress even a gorgeous design well calmly"; when "feel has good feeling ," the fans seem to increase. In addition, I use original cloth at a sliding paper-door and a shoji, a door and am active in the new collaboration with the field except the outfitting. 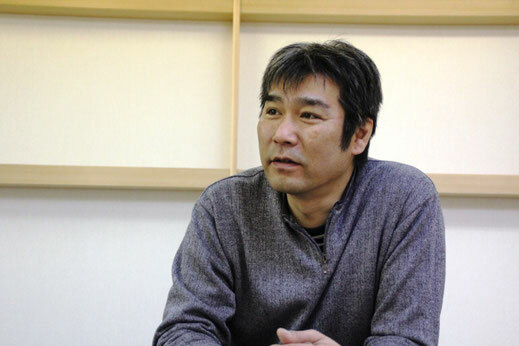 The Shiroi managing director who ties it to various end users with charm of the craftsmen of the dyeing texture as the concrete form called the Shiroi brand. 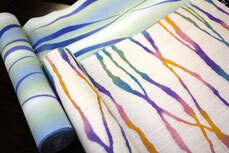 It will be to play an active part as existence of the producers of the textile industry more and more in future.